formal dresses for the most special day of your life. A range of fabrics and silhouettes that evoke uniqueness and romance. Check out what's trending now with the hottest wedding dresses for sale from Lalamira. Searching for the latest Sweetheart Ball-Gown Wedding Dresses Organza Beading Appliques Bow(s) Sleeveless Chapel Train designs? 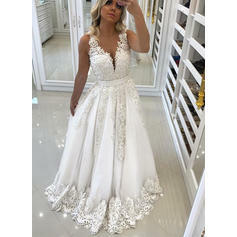 We offers an extensive 2019 new wedding dresses for sale collection. Check out the new styles you'll see on every bride in 2019 here.. I Bought this dress for my upcoming beach wedding. I am very pleased with how the dress turned out. I thought the price would correlate with the quality, I was wrong. The quality of the dress is really well done and perfect for a wedding dress. It doesn't look like a cheap dress! The top of the dress fits perfectly with good support and padding in the cups. I also did the custom fit and the waist area is to big on me, but that could be a user error. Overall, love the quality and upper fit of the dress. I will be wearing it for my upcoming wedding! Thanks lalamira!